Not for this birthday though for him. No, no. For this birthday I was jumping out of my skin with excitement on giving a little piece of paper. No flashy expensive pieces to gather dust on a mantel. No clothing vouchers and stiff napkined dinners, because seriously it’s not our style. What he did have was an afternoon and evenings trek up a mountain to watch a sunset with a lunar eclipse. Followed by a little star gazing. An opportunity to take an obscene amount of photos and maybe, just maybe throw a birthday wish on a shooting star. 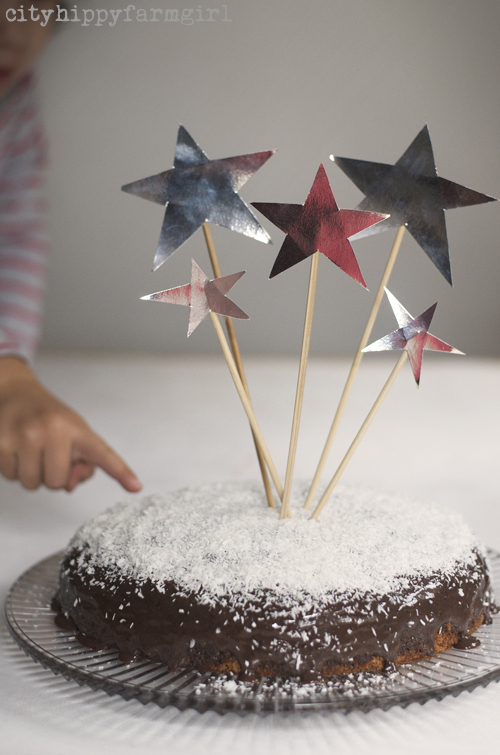 And in the mean time, we had cake…well, there will always, (always) be cake. 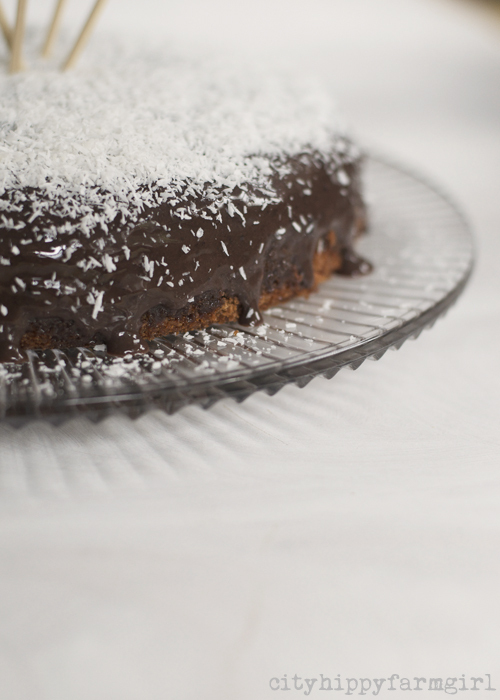 The Lamington Cake was revisited…and yes sticky fingers, VERY sticky fingers. The temptation was a little too much for her. Leave cake to soak up mixture, occasionally bringing the condensed milk back to the centre to soak in at the top a little more. Once room temperature, pop into the fridge for a couple of hours (or over night- you want as much of the condensed milk soaked in as possible.) Take the cake out of the tin and cover in desiccated coconut. This entry was posted in Connecting with Community, Food Glorious Food and tagged birthday cake, condensed milk, lamington cake, lunar eclipse, star cake, star gazing by cityhippyfarmgirl. Bookmark the permalink. He did love it Irene 🙂 Yay to that! what a great birthday present brydie..happy birthday monsieur chocolate! A lunar eclipse … What a lucky birthday present from the Universe!! We saw it last night too and it was absolutely stunning :-). Your cake looks pretty spectacular too! Lucky thing! I didn’t get to see it at all, too much cloud at the bottom of the mountains. Oh Mr Chocolate! How awesome. I hope that the skies weren’t cloudy at the top of the mountain. I absolutely love this post. 🙂 Your cake is simply gorgeous and love how your spent the birthday. Sounds like my idea of a perfect celebration. Yep, I think that’s a pretty cool way to spend a birthday…beats new cuff links. What a great gift….love the cake too. Jane I swear that condensed milk works on it. I know the CWA would frown upon it…but, but, but. hehehe Katie…they are everywhere apparently. Nope, every single birthday should be celebrated with balloons, awkward singing, party poppers, booze, your fav food and truck loads of cake (cause we all know calories don’t count on your birthday). 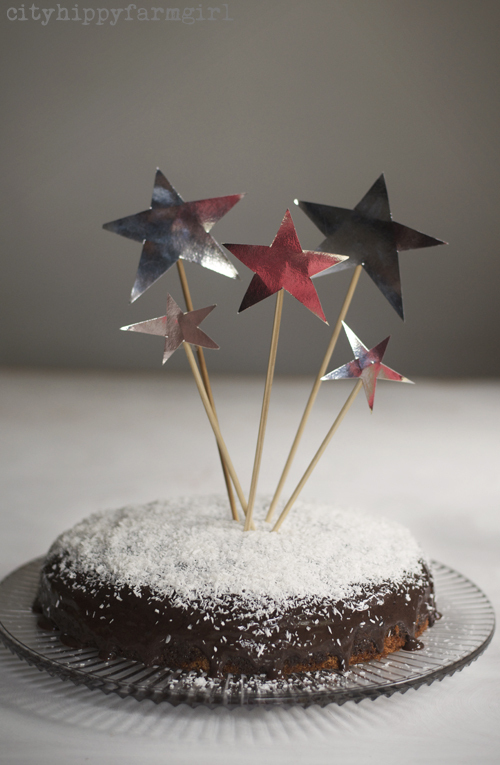 I adore birthdays, everyone’s birthday… I am glad you were able to celebrate with the moon and this beaut cake too. What an excellent birthday adventure. I’m delighted by the stars on your cake, I can’t imagine what your “big boy” thought. Little finger is precious. We would get on very well, I think, if we shared birthday celebrations in real life 🙂 This sounds like a slightly fancier (lunar eclipse!) version of my husband’s recent birthday and as such, just perfect. I love your cake too.